We are thrilled to announce the launch of our native extension for Adobe Air (ANE). The Adobe AIR native extension offers complete feature parity with other platforms supported by Fyber – such as Unity, Android, and iOS – and allows you to seamlessly integrate our ad platform into your Adobe AIR apps. 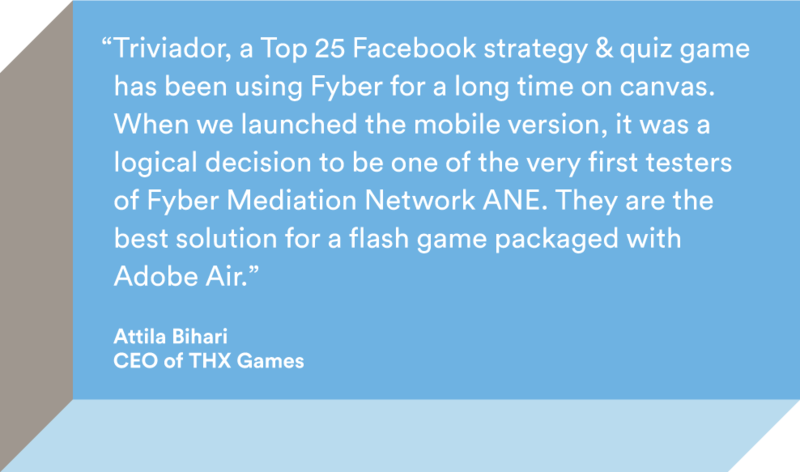 Publishers, such as THX Games, have already integrated Fyber’s Adobe AIR native extension to help bring their web games to the mobile world. THX Games spreads the joys of trivia across the globe with games that are culturally relevant to all users, on every platform. “Triviador, a Top 25 Facebook strategy & quiz game has been using Fyber for a long time on canvas. When we launched the mobile version, it was a logical decision to be one of the very first testers of Fyber Mediation Network ANE. They are the best solution for a flash game packaged with Adobe AIR,” said Attila Bihari, CEO of THX Games.